They say that the Samsung Galaxy Note II is perfect for effortless and instant creativity. To prove this, ColensoBBDO and Samsung collaborated with the New Zealand Herald’s legendary satirical cartoonist, Peter Bromhead, to demonstrate exactly what the phone is capable of, coinciding with its launch into the country. 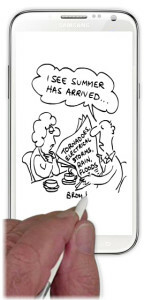 Every day alongside a top online news story, Bromhead drew the cartoon live on a Note II in front of readers on nzherald.co.nz. The campaign became New Zealand’s first live satirical cartoon and went beyond the banner, to become part of the content.